Your organization is challenged to deliver a diversified portfolio of cloud-based assets in your own data centers, as well as in a growing range of third-party data centers that enable more agile IT and service creation. But because managing this range of assets requires a hybrid operations model, you must also realign cloud selection strategies based upon the use of multiple types of cloud options. 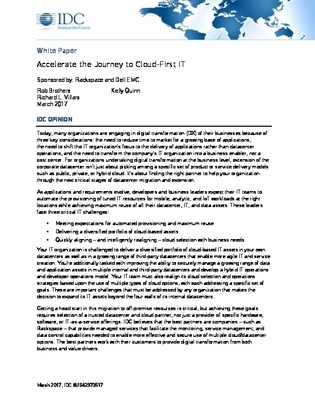 In this IDC paper, experts offer guidance on doing just that, and you’ll learn how to find the right cloud partner to help your organization through the next stages of data center migration and extension. Read on to confront the expansion challenges of cloud-first IT, learn the critical importance of private cloud, and hear from your peers about their cloud-first partner strategies.